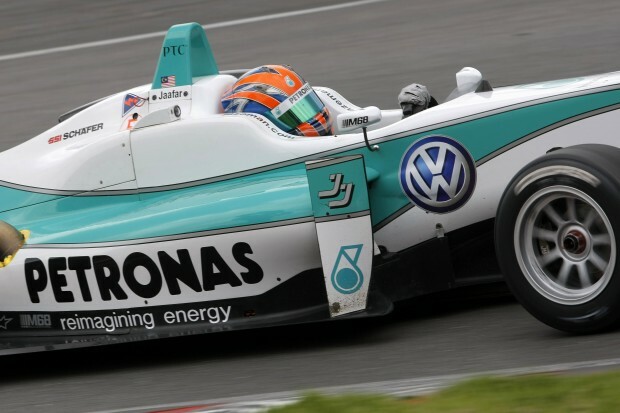 Jazeman Jaafar, championship leader in the British F3 International series, heads off to Germany for the sixth round of the championship and will be getting streetwise for the challenge of the temporary circuit on the roads of Nuremburg. Jaafar, along with the rest of the field of British F3 drivers, will be making his first visit to Norisring, so it will be a new experience and with a track which features fast straights, tight hairpins hemmed in by unforgiving barriers, the young Malaysian is expecting the weekend to be a steep learning curve. Norisring is a short, 1.4 miles (2.3 km) circuit, characterised by the Steintribune, an imposing concrete edifice, which is used as a grandstand for 25,000 spectators, towering over the main straight and is only used once a year for a festival of racing. With plenty of other viewpoints, the event attracts over 140,000 people. The weekend starts on Friday 29th June with a 125 minutes morning practice session for the British F3 field, followed by a 30 minutes qualifying session in the afternoon, setting the grid for the first and third races. The first two races will be held on Saturday 30th June and the final race on Sunday morning, 1st July.